The FTSE 100 Futures are trading at 7,181.80 with a loss of -0.40% percent . The CAC 40 Futures are trading at 5,320.50 with a loss of -0.34% percent . The DAX Futures are trading at 12,613.50 with a loss of -0.20% percent. The EURO Stoxx 50 Futures are trading at 3,572.00 with a loss of -0.11% percent . Poll results showing Macron’s followers are on track to become the largest party in the lower house of the French parliament sent France’s top flight index to a nine-year high. The benchmark pan-European Stoxx 600 ended the session 0.67% higher at 391.98, alongside gains of 0.96% to 12,647.78 for Germany’s Dax and an advance of 1.35% for Paris’s Cac-40 which finished at 5,372.42. Not unexpectedly, a snap opinion poll carried out by Elabe for BFMTV after a televised debate between the French centrist presidential candidate and his far-right rival, Marine Le Pen, on Wednesday night, showed 63% of viewers found him the more convincing of the two. 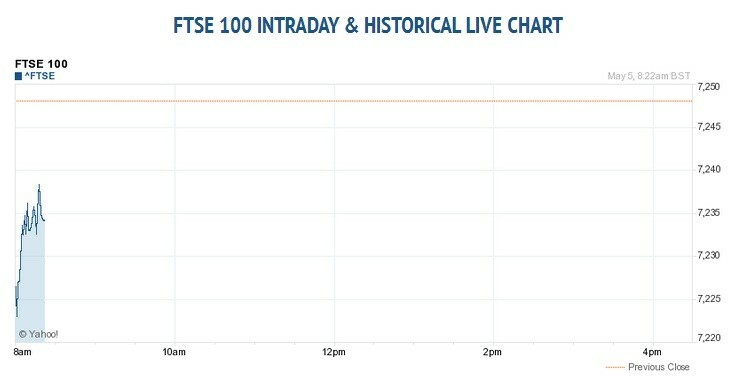 For the day the FTSE 100 closed at 7,248.10 for up with +0.19% percent. France’s CAC 40 closed at 5,372.42 for up with +1.35% percent. Germany’s DAX closed at 12,647.78 for up with +0.96% percent. For the day the Dow are trading at 20,951.47 with a loss of –0.03% percent. The S&P 500 are trading at 2,389.52 for up with +0.06% percent. The Nasdaq Composite are trading at 6,075.34 for up with +0.05% percent. In other parts of world, Japan’s Nikkei 225 are trading at 19,445.70 for up with +0.70% percent. Hong Kong’s Hang Seng are trading at 24,469.69 with a loss of –0.87% percent. China’s Shanghai Composite are trading at 3,103.04 with a loss of –0.78% percent. India’s S&P BSE Sensex are trading at 29,884.53 with a loss of –0.80% percent as on 12:34 PM .